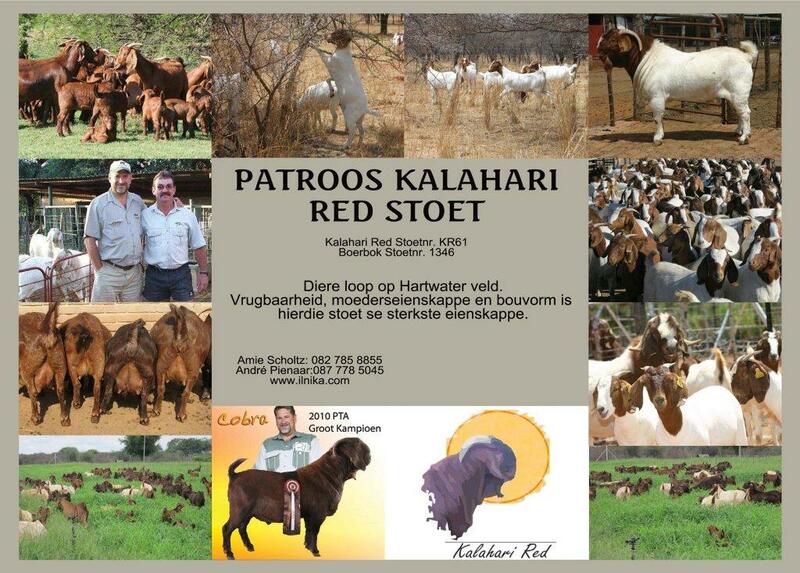 In 1994 Ben Vorster from Tshipise introduced me to the Kalahari Red Goats. Ben was one of the founder members of the Kalahari Red. They were well adapted to his farm and had good mother instincts. Every year while hunting on his farm I made a point of spending some time between his goats. Before I bought my first goats from him, I learned the basics of goat breeding from Ben by chatting around the campfire for hours. In 2001 I bought my first ram and 3 ewes from Ben Vorster and brought them to Naboomspruit. They were pregnant and lambed soon after I delivered them. Growing up breeding Racing Pigeons as a child, I was very set on record keeping and immediately registered my goats on an Excel system. Today my goats are all registered on the mobile livestock record-keeping system. This system allows me to create reports of every aspect of the goat farming. The program is integrated with the ARC and SA Studbook. Data is transformed electronically to and from our organizations. All my goats are registered with studbook and I am part of ARC's performance testing scheme and our goats could be viewed on the Intergis system. I was eager to learn and bought good rams to improve the herd. I did my first junior course in 2005 and a second in 2006. This is how I got involved in the Bosveldboerbokklub. I passed my first senior boergoat course in 2007 and again in 2009 under the eye of Lukas Burger and Francious Maritz. The SABTV appointed me as an inspector in 2010. Within a year I had bought 40 ewes and the hobby, became a small business. My involvement with the Bosveldboerbokklub was the best learning school and attending shows and auctions was a finishing school. Later when the rams got so expensive we joined forces when buying rams.The involvement of senior breeders taught me finer detail that they had gained from years of experience. Today I have 300 ewes on 16ha and have modeled my farm to be a sustainable Farm Setup. I positioned myself in such a way that I am able to sell production during winter, to compliment the nursery, that is mainly a summer season business. In order to improve on my heard I had to identify a breeder of which the average of his heard was better than mine. I only use SP (Studbook Proper) Stud rams in my heard to ensure that i, not only improve the heard but also breed studbook proper registered ewes and rams. My breeding policy includes selecting for fertility, good mother instincts, balance, meat, and femininity on the females. We breed animals that are well balanced and select our rams with care. All my latest rams are from the same breeder and from a specific female lines. We have seen the improvement since we adopted this policy. I have also started using my own rams in a line breeding program. Recently Ben Vorster and myself joined forces and joined part of our herds. As Ben was a founder member of the Kalahari Reds, he had excellent genetics. 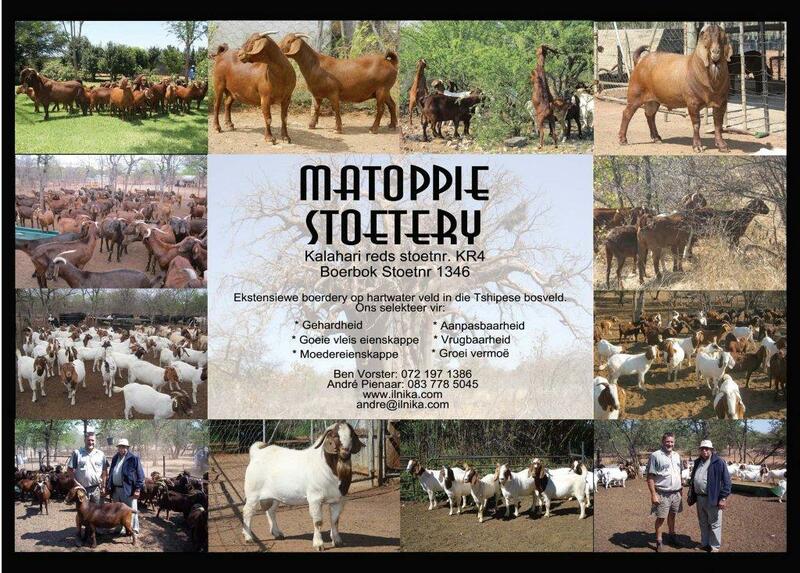 The Matoppie herd is kept on the Tshipese farm and consists of about 300 ewes. They are farmed extensively with the exception that they are placed in a kraal at night, to protect them against wild animals. 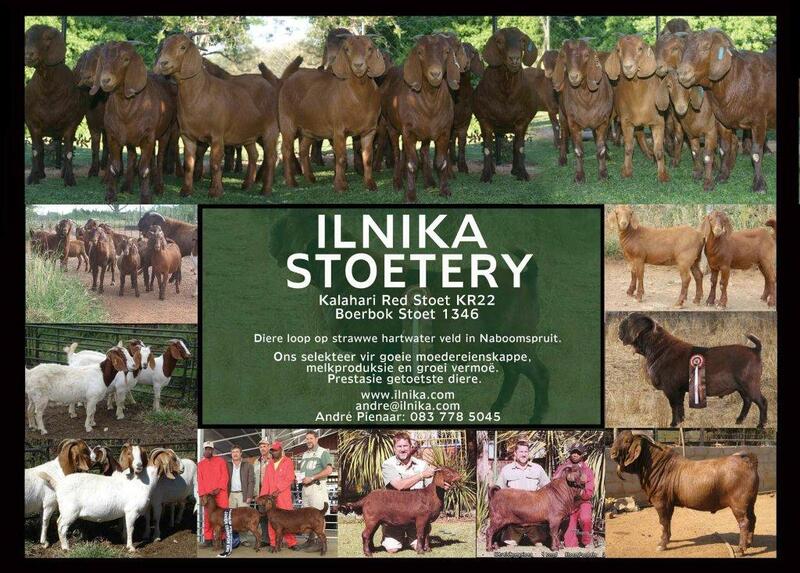 Breeding Rams are kept at the Ilnika farm in Naboomspruit. The breeding season differs slightly on the two farms to allow us to use the same rams on both farms. This allows us to stay with our breeding policy. This stud is build up of the breeding of Ami Scholtz and myself. Ami currently the president of the Savanna breeders association had to move his few Kalahari Reds to make place for the Savanna's and I saw the opportunity to use some of this excellent genetics in my herd. His fine goats are cross bred with rams from the other studs and prove to be a winner. Ami's knowledge, being a veteran in the goat industry, is very valuable in our herd. He is a natural geneticist and his feeling for breeding inspires me. he helps with the selection and preparation of our show goats.